Over the weekend I had the wonderful fortune to see the movie, The Way Way Back. It’s quirky and if you enjoy a good story, a good laugh and a good cry – it is all of that in just under two hours. I highly recommend it. Plus, it features this cool song by Edie Brickell that should be everyone’s mantra, which you can listen to while you read this. There is a poignant scene when Toni Collette’s character, a divorced mother, is being lied to by the man in her life. He has betrayed her and although she knows it’s true (you can see it in her face), she denies it. Or rather, she makes the choice to accept the lie, in spite of her son’s plea and her own knowing. I’ve had moments that resemble this scene, and they are so numerous I can’t even count them on my fingers and toes combined. They happened in small and large ways, and the feeling was always a sense that I had betrayed myself, but I pushed that feeling far, far away into the deepest part of me, a place so deep and wide it eventually entombed me. I can place myself into one of those moments right now and observe it, just like watching the scene in this movie, with the blessed benefit of hindsight. I was a woman afraid, and allowing myself to follow the thread of a lie meant both challenging the status quo and owning the possible outcome. Denying the lie allowed me to stay in my life, no matter how painful. Facing the truth can be a messy business. It forces us outside our comfort zone and contains the explosive potential to change our world – a place most of us have carefully constructed to preserve our beliefs. And being lied to puts our nose to the window of our deepest held beliefs about our deserved-ness and intrinsic value. It is a moment where our self-worth rubber meets the proverbial road. Following your heart is not easy. The truth that this sacred organ whispers is not always comfortable, but never a lie. It aligns us with our purpose and is often in conflict with what we hold to be true about ourselves. Listening to the heart brings about discomfort, something we seem wholly reluctant to feel these days. I read a statistic that one in four women are taking anti-anxiety medication and one has to ponder: are we really taking these drugs to quell anxiety or to quiet the voice of truth that gets louder each time we lie to ourselves? I believe we have the capacity to tolerate more discomfort than we give ourselves credit for and it can lead us home to our truest self. Pain can deliver deep insight. What if we treated it like a dear friend in distress, instead of clubbing it over the head with a pill or drink? The underbelly of denying our reality is this: it creates a toxic compost of deception beneath our feet, undermining everything we do. Our heart is the truest and most accurate technology we have – an instrument of truth and love. 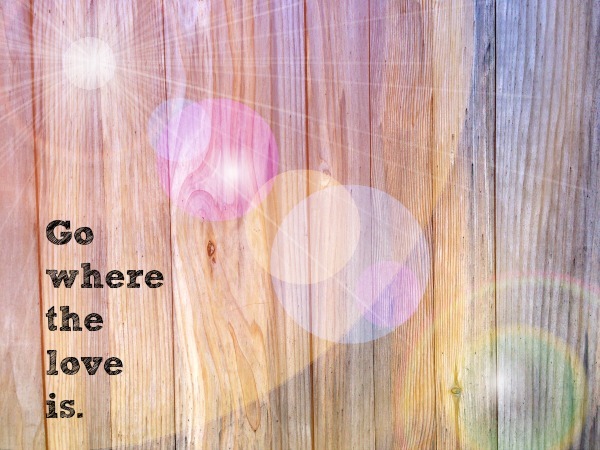 Listen to the song – go where the love is – this is why we are alive. Do you ever lie to yourself so your life doesn’t crumble into ruins? Perfect timing Dianna! I just saw this movie and loved it. A lot of strong points – the strongest as you stated, learning to follow your heart – even when its scary and you have no idea what will happen. We pay a price, sometimes just sniffles, sometimes years of agony by not listening to our heart and being willing to follow. Our heart knows best, we just have to learn to trust.